Integra Quick Reports, the leading tool for end-users to integrate Lotus Notes with Microsoft Word and Excel, has today announced Virtual Field Mapping functionality. This enhancement increases the usability and enables the delivery of more complex ad-hoc reports, Word mail merges and Excel exports without the need to escalate to a developer. 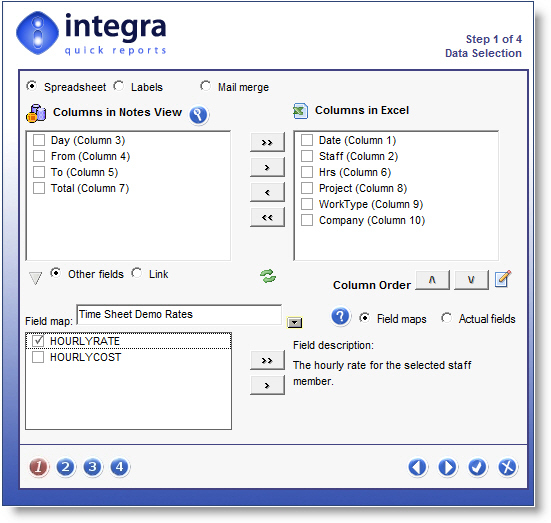 “Integra allows point & click access to columns in views, and enables access to fields on forms with a full preview of the form,” explained John de Giorgio, CEO, Integra for Notes. “ Many times however, the design of a database involves complex field names and lookups to other views providing a challenge to end-users. “Integra Quick Reports’ new Virtual Field Maps allows a developer or super-user to configure a set of virtual fields with easy to use names which relate to specific physical fields. These virtual fields can also contain a Notes formula including but are not limited to a lookup. For instance, choose the Virtual Field called MyManager and Integra Quick Reports runs a lookup to define who the manager of the current user is,” de Giorgio added. When an end user launches Integra Quick Reports, they are presented with the list of virtual fields predefined for the current document in the More Fields section of the first step of the wizard. If no field mapping was specified for that form then the physical fields would be displayed. The user will then have the option of switching between the virtual and physical fields on the selected form. Integra for Notes and Integra Quick Reports enable integration of Microsoft Office documents into Lotus Notes business processes and are used by companies to improve the analysis of Notes data, reporting, charting and presentation via Microsoft Excel and Word, XML and PDF files. Integra for Notes can source data from multiple databases including SQL, DB2, SAP etc and allows output to be distributed via e-mail and updates Notes data.